No Wifi? personally I’d rather have WiFi then Bluetooth. So is this a Linux, Android, or Windows CE device? and no GPS? No WiFi? Other info we have seen has said that the device will include WiFi. I would imagine that it is so obligatory that they actually didn’t include it on the list, though I’ll keep my eye out to make sure that is the case. The unit is running Ubuntu Linux, and does not have GPS. according to engadget(cn), it has wi-fi, and bt can be used to pair up with cell phones to go online. I concur with Ben on the Linux and GPS issues. How would this be any better than your average WinMO PDA? Dell, HP etc? There’s more SW for those, and very close to same size screen, ok an inch less (almost) but still?! The difference is a relatively full (and open) OS as compared to a mobile (closed) OS. while there is more software in theory, the reality will be found in the package manager used (if any) and ease of access to root. if those two are found, this may be a nice competitor to nokia’s tablets. and if it makes use of the moblin framework, it should be relatively easy to use software from saud tablets. Im posting this using Ubuntu an the software for it runs better and is all free. It has an app store page to add programs. I have found that networking especially wifi is better on ubuntu than xp. I dual boot this laptop with xp and ubuntu and the wifi is very slow to connect on xp, but almost instant on ubuntu. Just check the official site of SmartQ. The system is based on Ubuntu and it have wi-fi and bt. They update a short munal today. Really looking forward to this actually. With A 667 Mhz ARM 11 under the hood and 128mb DDR2 ram, although performance will not be spectactular, as the article says, it should still be good for single-service use. Lets not forget that with 3rd party apps we can also expect Mpeg 4 video decoding in multiple formats/containers upto DVD resolutions as well as support for a multitude of audio codecs. If you visit the apps section of the SmartQ site there are also a whole load of apps available including a Bit torrent client, maps, email client, Nes/Snes/GBA emulators etc etc and surely many many more due to the fact it is ubuntu based. With a 2000mah battery hopefully battery will be decent too. At this price point you really couldn’t ask for more, although i’m expecting something closer to $200 after export. If the cost is $200 then this will end up in my pocket for sure, if only out of curiosity. Any word on the quality of the video playback experience? I think the OpenPandora project demonstrated that 128MB of RAM was not sufficent to have fluid ARM ubuntu perforamnce. I’d buy this if it had double the RAM. I wonder what kind of video chip it has. Most ARM11 chipsets have atleast a OpenGL es 1.1 chipset for smartphones. What are you babbling about? Pandora moved on to 256 MB RAM because the console has been delayed so fscking long that the price difference between the two versions has become almost nil. I didn’t say Pandora was upgraded to 256 to get ubuntu working. ubuntu is not even the first or secondary OS. Did you check the performance of ubuntu-arm videos before and after the upgrade? exophase wasn’t able to get it running well at all on 128mb. It took a long time to load up and start applications as it shuffled memory usage to virutal ram on the sd card. Unoptimized proof of concept running on prototype hardware doesn’t demonstrate anything. Linux with GUI runs well on even 32 MBs, you just have to cut away the bloat. We’re not talking about Linux + desktop which can fit on 8BM of ram. It was a port of the full ubuntu desktop for ARM and a lot of hard work was put into it. It was a barebones as it could be to work on 128MB of RAM. Meh. The only interesting thing about this unit is the $132 price tag. This device has very similar specs to the ancient Nokia N800. What is “USB On-The-Go (OTG)” how is it different that regular USB? iirc, it means that if the device is plugged into a computer, it will show up as a storage device or similar. but if a usbstick or some other device is plugged into the Q5, it will be able to read and write from it. originally usb had a kind of master/slave setup, with the master (laptop/desktop) doing all the “thinking”. but as mobile phones and other devices got smarter, and people wanted the ability to plug their camera or similar into them for quick file transfer between device, the OTG standard got set up. basically, if one have a DAP thats OTG compatible, one should be able to use it as a extended storage for a camera, for example. OTG is micro plugs with low power. You probably won’t be able to use it for anything except connecting it to a computer. Still, good hardware for the price (especially the screen). Not everything has to be cutting edge, there is a market for low priced adequate products. Finally got my hands on a smartQ 5 on 1st Apr! Good stuff. Are you blogging about it somewhere too? If not, we’d be honoured if you could write a short article for us. 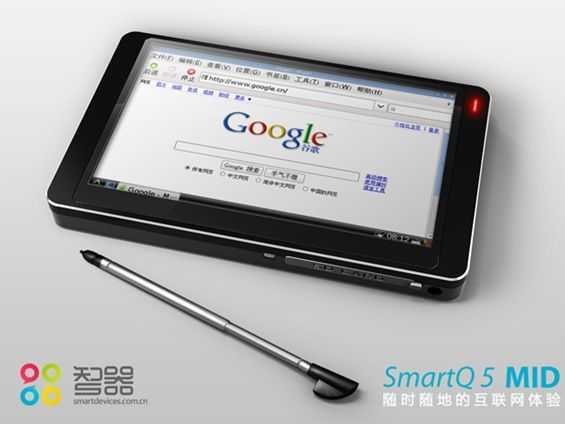 I saw this review of SmartQ5 http://chinagadgetdeals.info/smartq5-is-a-cheap-but-powerful-mobile-internet-device/ and am going to buy one. SmartQ5 Rocks! « Connect with 70+ Ultra Mobile fans on Twitter via g_rouping.